It's just good to know the Dakine Faye bike shorts in the closet. Because as soon as the weather warms, this comfortable sports pants is tightened in order to walk or mountain biking, hiking both. By their functional material pant dries quickly when it is exhausting. In addition, the fibers are stretchable in all directions, making it really comfortable. 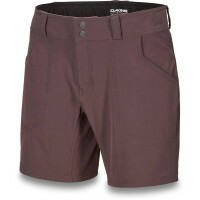 Whether storming the summit or mountain hut sit that makes itself as Faye pants by Dakine and there quite wonderful. Customer evaluation for "Dakine Faye Bike Short Black"